Springtime welcomes cold, colorful lunches back into our lives. After a winter of dumping cans into slow cookers, there’s nothing more refreshing than a vibrant salad. And if you’re like me, you want your salads to be HEARTY AF: loaded with color but also protein + healthy fat. 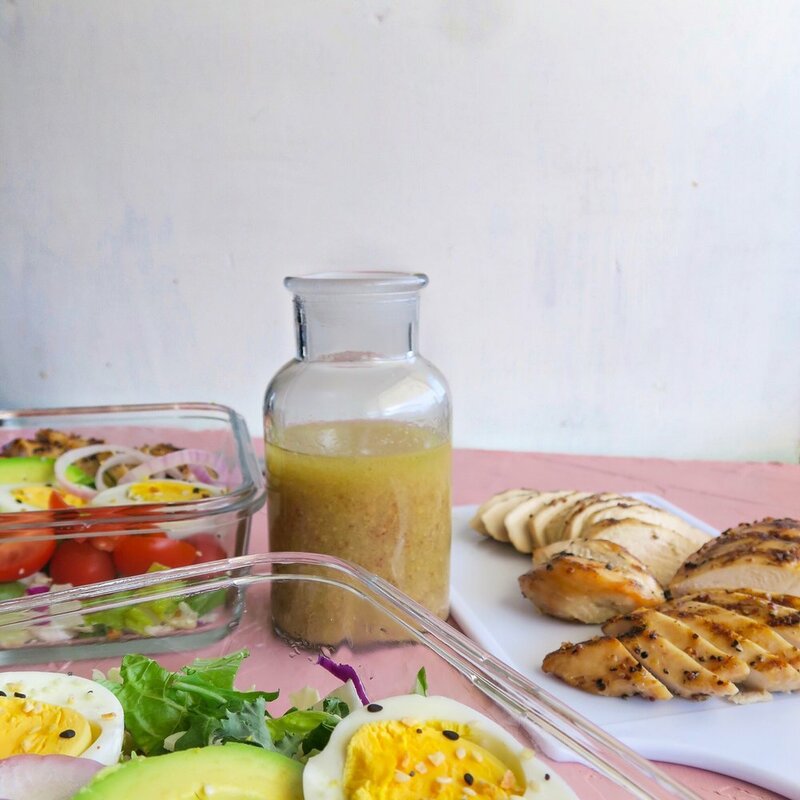 Today’s salad has NO shortage of protein, you’ll get plenty from the boiled eggs and honey mustard chicken. I’ve also packed these with healthy fat from avocado and the most delicious olive oil-based honey mustard dressing. It’s a classic cobb salad that you’ll look forward to all week! In a word, these honey mustard cobb salads are versatile. You can keep the toppings simple or load ‘em up. For me, it’s gotta have some purple onion and a boiled egg. But feel free to build these up to suit your preferences or macros. Another versatile thing about this salad is that the honey mustard recipe is both a dressing and a marinade! Simply split the recipe in half and you’ve got both, woop woop! One last versatile thing about the honey mustard is that, in a pinch, you can use it as a GLAZE over cooked chicken breast. Most grocery store delis have pre-cooked chicken breasts available these days. So if you go the shortcut route (or don’t have time to marinate), just brush some honey mustard onto your cooked chicken and heat it under your oven broiler for a few minutes. I took some liberties for a pretty picture that are deceiving (…sorry for the confusion!) I’m referring to two toppings: avocado and eggs. If you’re going to meal prep these more than two days, I do NOT recommend slicing avocado and storing it inside the salad. It will brown. Instead, store slices wrapped airtight in saran wrap OR cut up your avocado when you’re ready to eat. Avoid as much air exposure as possible to keep that avo green and fresh. As for eggs, I recommend storing them inside the shell and packing one every day with your salad. Peel and slice the egg when you’re ready to eat it. Easy enough, right? There are too many topping options to factor in, but this is a good start. Track other ingredients according to your preferences. Note: This is enough honey mustard for both the dressing and the marinade. Grape tomatoes, purple onion, turkey bacon, boiled eggs, avocado, sunflower seeds, or whatever else you fancy in a Cobb salad. Use a standard blender or immersion blender to whiz ingredients until well-combined. Split it to use half as your marinade and half as your dressing. To marinate raw chicken: In a shallow dish or a gallon-size sealable bag, add half of your honey mustard marinade along with chicken breasts. Refrigerate for at least 4 hours but up to 8. To grill chicken: Grill chicken breast on each side for about 5 minutes or until the internal temperature reaches 165 degrees. Pre-cooked chicken shortcut: You can also purchase cooked chicken breast and use honey mustard as a glaze instead. To do this, turn your oven broiler on HIGH and brush chicken with honey mustard. Broil chicken for 3 minutes. Remove chicken and brush it once more. Broil another 2-3 minutes until a honey mustard glaze develops. Chop chicken and vegetables. Stack your salads in meal prep containers with lettuce and preferred ingredients. Portion dressing into condiment cups. Don’t dress salads until you’re ready to eat them or else they’ll get soggy. Advice for avocado and eggs: Even though the pictures show them sliced, I highly recommend peeling and slicing the egg when you’re ready to eat it to preserve freshness. Likewise with avocado: avoid air contact as long as you can to prevent browning.